One of the happiest trends in fashion we're re-entering right now: color block. Luckily it's not so much translated into geometric shapes or graphic patterns but more into combinations of simple, plain and bold pieces. Besides flower prints I think it's a trend to look forward to since it's an instant uplift to the wardrobe and perhaps the mood as well. Plus, it's a great inspiration for making moodboards as you see here. How do you feel about this colorful trend? Are you going along with it or not? Maybe just a little? I love these colors. I love adding gold with any colors! These are beautiful! Great post! I'll most definitely go along with it, I don't know how often, but I will. Sometimes I feel the need to escape my neutral looks and experience some bright combinations. What a beautiful Color combination! 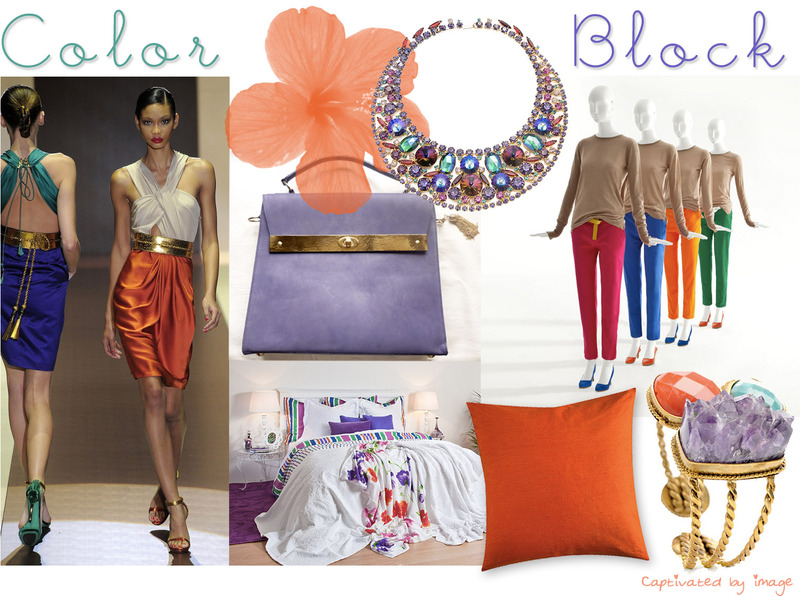 Loving Lavender + Orange! So Cheerful! Divine!!!!! well, you've definitely sold me this trend!